For under $100, you can find a very good spinning rod, and you will have many options. With all the options on the market today, it can be difficult to narrow the selection down to the final rod you want. Here, we will recommend our choice for the best spinning rod under 100 dollars. This table will help us view the candidates for the best spinning rod under 100 dollars. From one of the premier name brands in fishing comes the HMG, the first graphite rod ever made and now it is refined to be better than ever. 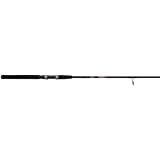 This rod is available from 6 feet to 7.5 feet long in powers from ultralight to medium heavy. It’s interesting to note they have a 7 foot ultralight power rod, which is longer than you will find many ultralight rods. The sensitivity on this would be outstanding. Line ratings start at 2 pounds and go up to 17 pounds, giving you a very wide variety. Actions come from Medium to Fast, so this series would be great for most species of fish that don’t have super thin mouths. The blank material is graphite for the ultimate sensitivity and strength, and the handle material is basically an enhanced cork that doesn’t lose its grip when wet. It also has foam where needed for extra comfort. It has the option of coming in one or two pieces so you can choose what you prefer. Reviewers say this is one of the most sensitive rods they have ever used, with a crisp, forgiving action that enhances sensitivity. This rod also comes with a Limited Lifetime Warranty, which means if it breaks due to a manufacturers defect at any time during your life, it can be replaced for free. It also protects against accidental damage, where if it breaks due to an accident, they will give you a great deal on a replacement rod so you don’t have to pay full price again. The Veritas 2.0 is a beautiful white rod that comes in two lengths, 6.5 and 7 feet. The lightest power it comes in is medium light and it gets up to medium heavy, making it suited for those medium sized freshwater fish like northern pike, bass, walleye, trout, catfish, and anything else that may be in that size range up to 15 pounds. In fact, it is rated for line from 6-14 pounds. The actions are medium fast to fast, providing a quick hookset and good spine for this size of fish. This rod can come in either one or two pieces depending on what your preference is. The handle material is foam, which is comfortable to grip and doesn’t lose any grip when it’s wet out. The material this blank is made of is graphite for great sensitivity and strength. Customers are satisfied with how light this rod is, as well as its sensitivity. Abu Garcia has a limited warranty of three years from date of purchase against manufacturers defects. They don’t offer anything if the rod is broken on accident, unlike Fenwick. For those looking for a durable yet fairly sensitive rod, Ugly Stik is the way to go. 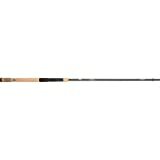 Ugly Stik has a reputation for being one of the most bulletproof rods on the water, and for that reason, those who are concerned about broken rods always go with these. The standard Ugly Stiks weren’t ultra sensitive and lacked some spine, so Shakespeare upgraded them by combining their traditional fiberglass with graphite to add this. The result was the GX2, a fiberglass and graphite combo. The GX2 comes in lengths from 5.5 to 7 feet and in medium power only on Amazon. The line rating for these rods is from 6-15 pounds. Action is fast for good hooksets and sensitivity. It is available in either one or two pieces. Since Ugly Stik combined fiberglass with graphite, this rod is very durable yet more sensitive than their traditional rods. It may not be quite as sensitive as a full graphite rod, but it will take an absolute beating from kids, trucks, and more and keep fishing. So, if durability is what you are looking for, this rod is the way to go, at a great price to boot. All three rods above share some common threads but are also different in many ways. Choose the rod that fits your scenario and budget the best. If you have questions about how to choose the right spinning rod, click here. Good luck choosing a spinning rod under a hundred bucks! If you’re in the market for a great spinning rod, our list here will highlight some of the best spinning rods money can buy.